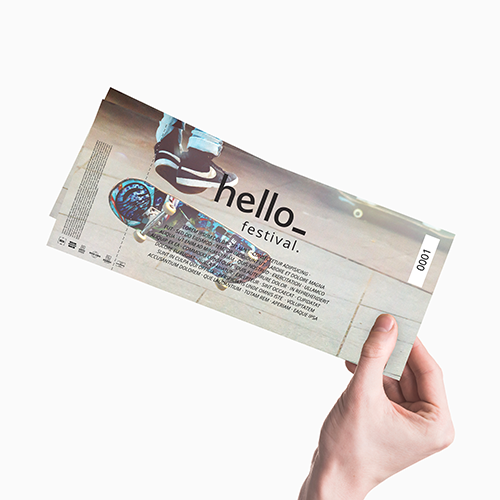 Helloprint delivers professional and unique entrance tickets. Top quality printed entrance ticekts! 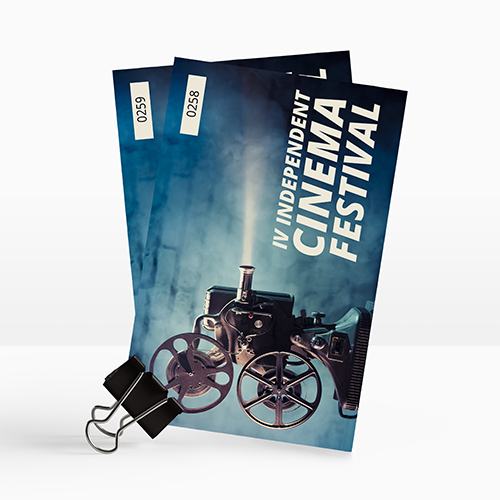 Entrance tickets can promote your event even more. These 1st class entrance tickets are availible in multiple colour and perforation options. 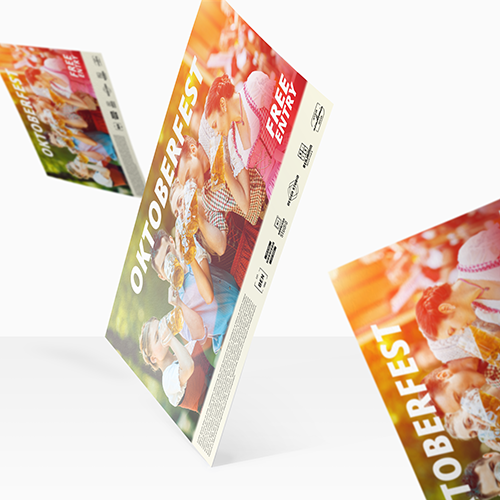 With entrance tickets from Helloprint you boost your event. Make sure you let us know where we should place the perforation. The best option is to show this in your design with small marks in the bleed area. How to submit when I would like to have black light ink? Afin d'obtenir un design visible à la lumière ultraviolette ou lumière noire, l'encre sera imprimée par dessus le visuel normal. La partie devant être imprimée avec de l'encre ultraviolette doit être nommée "UV" et doit avoir la valeur "100% magenta". Tous les éléments de la partie "UV" doivent être prêts pour la surimpression. 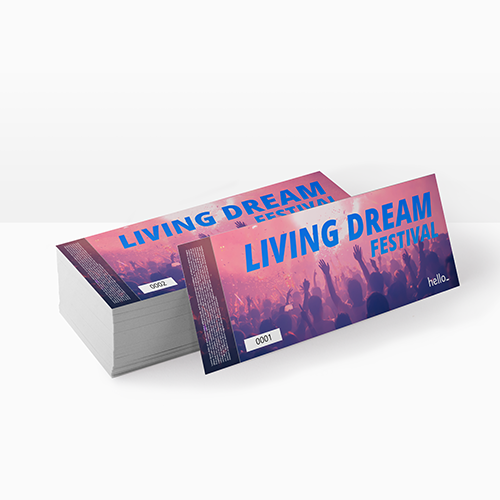 A ticket is an unfolded, often numbered and perforated paper item - perfect for events and parties. For the delivery of your entrance tickets we use multiple carriers. Because of the highest reliability, in most cases we use UPS or DPD. 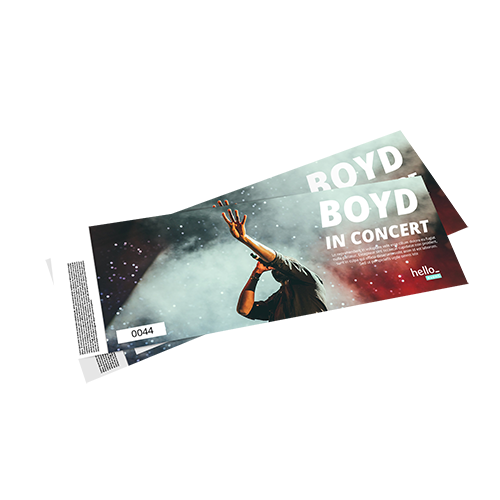 The entrance tickets that is chosen in most cases can be selected via our website. What is a perforation and where will it be placed? A perforation tear line is an indication to the production team to show where your perforation should be. It can be placed in a straight line anywhere on the ticket. This makes it easy to tear off the stub and ideal to use as a ticket. Always provide a sample file in which you indicate where the perforation line has to be placed, for a line in the final file will be been printed together. Where will the numbering be placed on my tickets? You can decide where the numbering will be placed on your tickets. In this case, always send an example where you show where the numbering should be placed. The numbering starts from 0001. If you want the numbering to be in a different sequence start with a different number, please request a quotation.